Announcing the 2019 Lightbulb QSO contest, March 9th 20:00 UTC through March 10th 20:00 UTC. 1. Household – an antenna constructed of any lightbulb available for purchase in normal home use applications. 2. Commercial/Industrial – an antenna constructed of any lightbulb available for purchase in commercial and/or industrial applications. 3. Homebrew – an antenna constructed of any home made light bulb that radiates visible light when power is applied. 4. Dummy Load – any lightbulb that normally serves as a dummy load (see miscellaneous rules). Please note that the administrators do not recommend this category of operation because it puts both the operator and RF sensitive equipment in close proximity to the load. However, several, lightbulb purists wanted the category so here it is for entry at your own risk. 5. Freestyle – ?anything goes. Get creative and string all of your Christmas lights together, what ever you want and as many lightbulbs as you want. Bring down the power grid if you must.. we just don’t care, but certainly want to reward extreme creativity. The Objective of the Lightbulb QSO contest is to build and use an antenna constructed in a manner so that the lightbulb is a key component of the antenna and to promote understanding and practical application of antenna matching concepts that allow a lightbulb to be used as a radiator in two way radio communications. Saturday, March 9th, 2019 20:00 UTC through Sunday, March 10th, 2019 20:00 UTC. As you might notice, this isn’t the typical QSO Party. 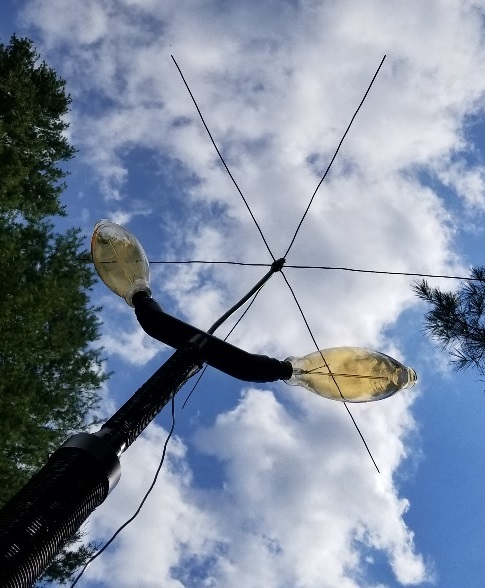 I love the idea–it reminds me of a QSO party I did once which challenged you to use unconventional antennas (I logged a number of contacts using a pair of trampolines!). I also appreciate the opportunity to build something new and participate in a contest that (obviously) doesn’t take itself too seriously. What fun! 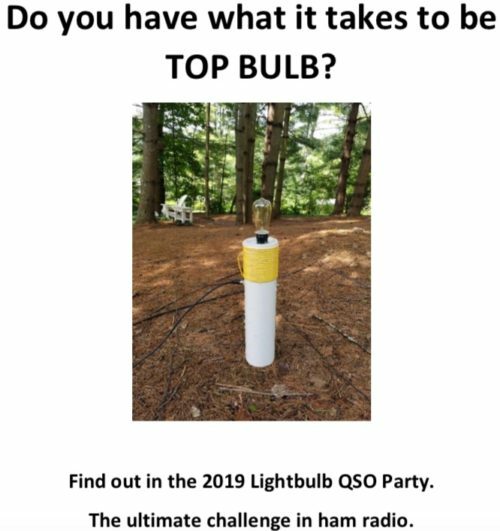 If a Lightbulb QSO Party sounds like fun to you, start planning your antenna now! https://hamsignal.com where all the research, observations, schematics, downloads etc. are located. https://hamsignal.com/blog/the-lightbulb-qso-party the page for the QSO party – rules date, times, etc. Thanks for putting this contest together, David! This entry was posted in Announcements, News and tagged Contests, David Day (N1DAY), Lightbulb QSO Party. Bookmark the permalink.